Sometimes it's difficult to measure one's progress toward completing a PhD dissertation. But one indication of progress is the accumulation of more books. By this measure I'm doing pretty well, with the aid of my supervisor distributing some of his father's theology books to his students and a used book sale by St. John's college library. Regardless, the piles of books around my office began to indicate the need for a new bookcase. I actually already had an assemble-yourself bookcase lying around waiting to be assembled-myself, so now appeared to be the time. 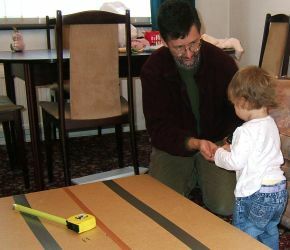 The instructions indicated that it should be possible to assemble it in one hour if two persons dedicated themselves to the task. 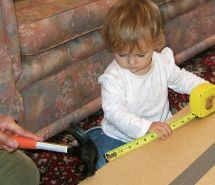 Crystal asked, "How long do you think for one adult and a toddler?" We set ourselves to find out. 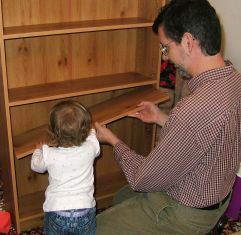 Some of my fondest memories from childhood through adulthood are of helping my dad with projects (though usually much more beautiful projects than hacking together a store-bought bookcase, but ya gotta start somewhere! 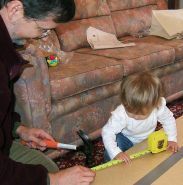 ), so it was a delight to have Ellie excited to lend a hand. 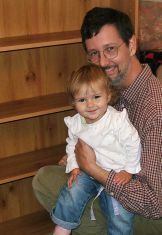 Now that's progress, both as a student and as a father-daughter team! We have now been granted an extension to our UK visas so that we can stay here until January 2009 — hopefully it won't take that long to finish my PhD! I was particularly tickled by the letter from the UK Home Office granting Ellie's extended visa. 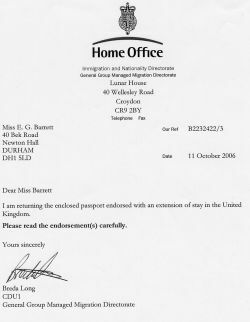 The letter read, "Dear Miss Barrett: I am returning the enclosed passport endorsed with an extension of stay in the United Kingdom. Please read the endorsement(s) carefully. 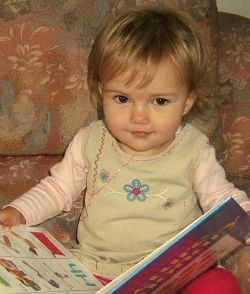 Yours sincerely, ...."
Maybe the Home Office has noticed how advanced a reader Ellie is or maybe the British just expect alot of 17 month olds! In any case, lest you think Ellie is overly studious, here's one of her more silly moments.